The Little Ferry Public Schools Media Center which is located in the Memorial Middle School, serves as a hub for students and classes during the school day. 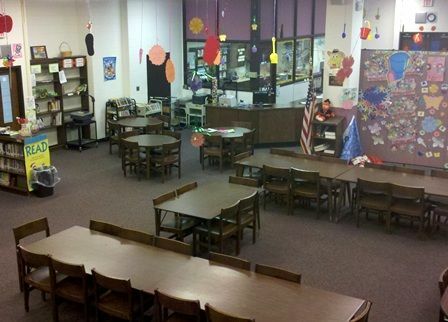 With its over 12,000 pieces of material, 30 computers, multimedia projector, 4 large flat-panel TVs, and lots of seating, the Media Center is utilized extensively both during the school day and after hours. Civic, school related organizations utilize the facility for meetings and all of our Board of Education public meetings are held here. The Media Center as it has been known for the last few years, used to be just the plain old library! Many graduates of the school will remember the "pit". This was a step down conversation area previously located where the computer stations are currently located. The library has grown into a more diversified entity with the times and has truly become a Media Center. The Media Center staff uses the Destiny Library Management System from Follett. This allows inventory and barcoding of all materials and speeds checkouts and check in of books. It also provides 2 applications for students and staff to search the Media Center inventory and research titles.